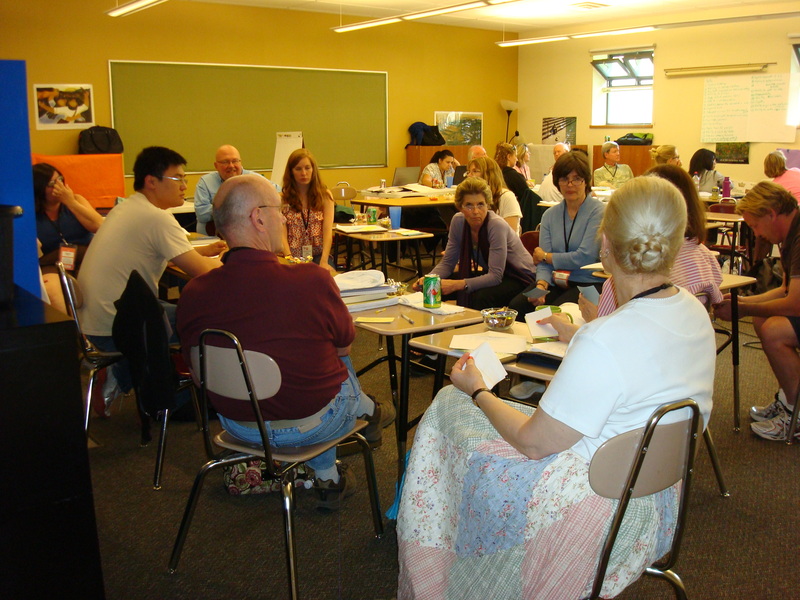 Topics tackled by the group on the fourth day of our Telluride Roundtable on “Open and Honest Communication Skills in Healthcare” included mindfulness and culture. The morning’s session on mindfulness, led by Bob Galbraith and Anne Gunderson, generated considerable discussion on the impact mindfulness plays in both open and honest communication skills and in high-reliability organizations (HRO’s). HRO’s are not satisfied with their successes. They have a preoccupation with failure and their culture is one where people feel safe to report incidents. 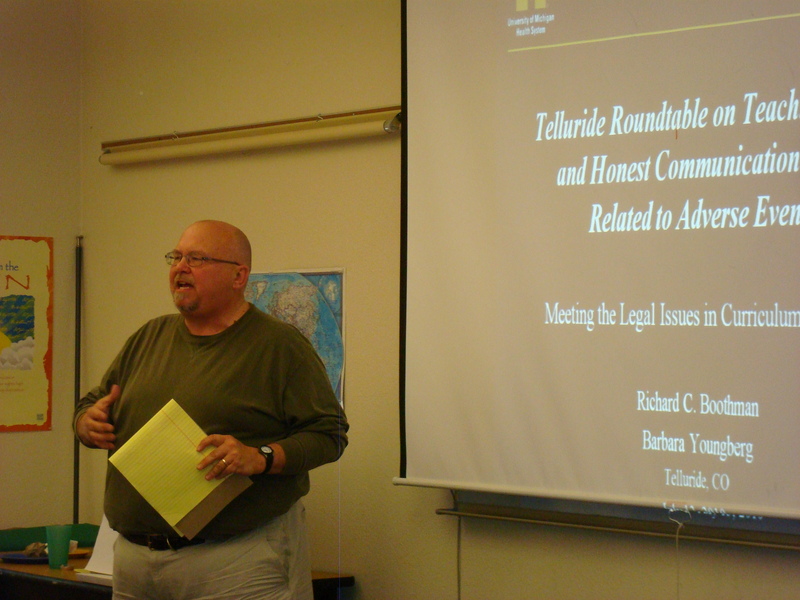 Today was the midpoint of our Telluride Roundtable on “Open and Honest Communication Skills in Healthcare”. 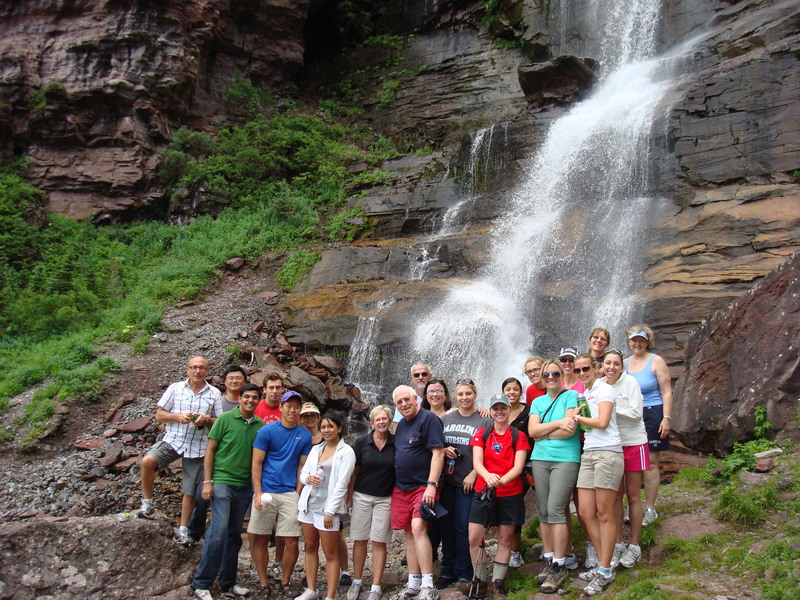 After two full days of discussion, discovery and curriculum building, many participants shared a group hike up the mountain to Bear Creek waterfalls. The scenery was magnificent and the two-hour climb provided hikers a great opportunity to reflect on the first two days of work while continuing discussions on open and honest communication issues before reconvening in our classroom for the afternoon working session. Participants were still feeling the excitement and energy generated from Tuesday’s sessions on shared decision-making and open disclosure education. To start the day, students from medicine, nursing, public health, pharmacy and law attending the Roundtable watched the film “The Faces of Medical Error…From Tears to Transparency: The Story of Lewis Blackman” to start the day. After the film, Helen Haskell and Rosemary Gibson led an engaging and interactive discussion on the educational messages highlighted in the movie. The conversations were empowering and got us off to a great start. The students added an amazing dimension to our discussions on open and honest communication. Their excitement and passion was contagious; their ability to appreciate right from wrong without pre-existing cultural biases was refreshing. 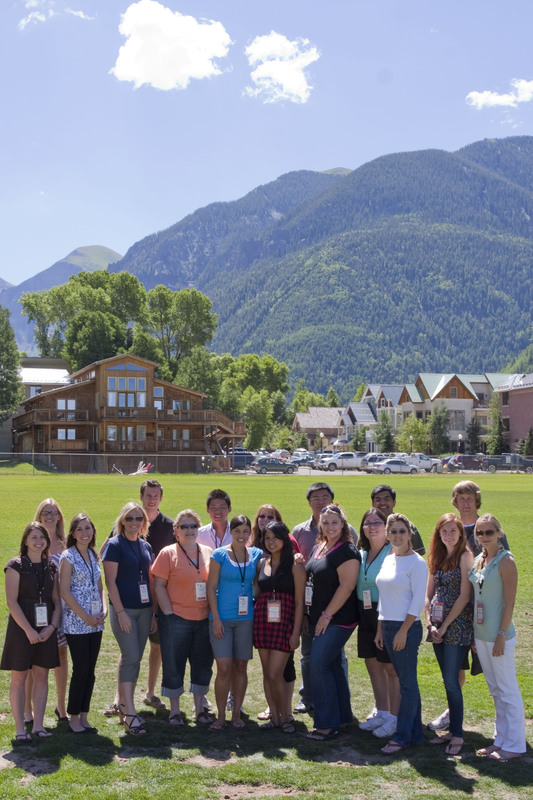 Welcome to the Sixth Annual Patient Safety Roundtable in Telluride, CO – an annual retreat for those of us working to help make healthcare safer through education. This year’s work will focus on open and honest communication skills in healthcare, addressing the barriers surrounding transparency from informed consent through the continuum of care when unintentional harm occurs. As we wait for this year’s Roundtable to begin, the sun has already begun to peek over the beautiful Telluride valley and the southern Colorado Mountains, signaling the start of another beautiful Rocky Mountain summer day. Greetings! Welcome to our blog. So glad you found us. Our hope is that this site generates important conversation among caregivers, administrators, patients, families, educators, policy makers and others on two very important issues in healthcare today: (1) the medical error crisis, and (2) while appreciating that medical errors will never be eliminated, how we respond to patients and family members when unintentional harm results from our care. In addition to providing an unforgettable learning experience for health care providers, Lewis Blackman continues to touch the hearts of all who hear his story. Most recently, The Faces of Medical Error…From Tears to Transparency: The Story of Lewis Blackman, was awarded a 2009 Aegis Award—a worldwide film industry honor given to the very best film and video productions of the year. Of the 2,109 entries, The Lewis Blackman Story received top honors, achieving the highest score awarded by a panel of peer judges.